Nigerian President Muhammadu Buhari's wife has warned him that she may not back him at the next election unless he shakes up his government. In a BBC interview, Aisha Buhari said the president "does not know" most of the top officials he has appointed. She suggested the government had been hijacked, saying a "few people" were behind presidential appointments. Mr Buhari was elected last year with a promise to tackle corruption and nepotism in government. 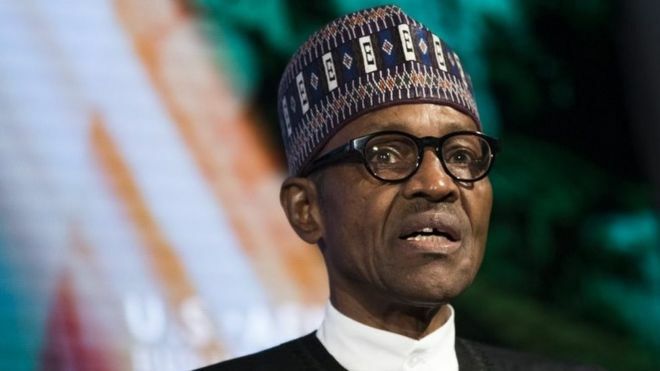 His wife's decision to go public with her concerns will shock many people, but it shows the level of discontent with the president's leadership, says the BBC's Naziru Mikailu in the capital, Abuja. The president famously remarked at his inauguration that he "belongs to nobody and belongs to everybody". In the interview with Naziru Mikailu, Mrs Buhari said: "The president does not know 45 out of 50, for example, of the people he appointed and I don't know them either, despite being his wife of 27 years." She said people who did not share the vision of the ruling All Progressives Congress (APC) were now appointed to top posts because of the influence a "few people" wield. "Some people are sitting down in their homes folding their arms only for them to be called to come and head an agency or a ministerial position." Asked to name those who had hijacked the government, she refused, saying: "You will know them if you watch television." On whether the president was in charge, she said: "That is left for the people to decide." Mrs Buhari said her husband had not told her whether he would contest the 2019 election. "He is yet to tell me but I have decided as his wife, that if things continue like this up to 2019, I will not go out and campaign again and ask any woman to vote like I did before. I will never do it again." Asked what she regarded as the government's major achievement, she said it was to improve security in the north-east where militant Islamist group Boko Haram has waged an insurgency since 2009. "No-one is complaining about being attacked in their own homes. Thankfully everyone can walk around freely, go to places of worship, etc. Even kids in Maiduguri have returned to schools," Mrs Buhari said, referring to the city which was once the headquarters of the militant group. Good woman saying exactly what's on her mind. Many APC faithful feel the same way as this woman. Zombies will call her a wailer. Even Job's wife told him to curse God and die. the end justifies the means. Aisha cannot say all this. Even if she did, she must have been deceived by the ever cunning power hungry enemy. My Sai Buhari should be very careful with this enemies going forward. They want to destroy him using his loved ones. We know the dark and diabolical hards behind this show of shame. They only want to push the "more loyal king's men" away and then draw the long swords on him. Daura and Kyari are more important in this government of change than any delusional power hungry schemer. I trust my Sai baba to handle this "storm in the teacup" being stirred covertly by the cowardly mortley mob. "He is yet to tell me but I have decided as his wife, that if things continue like this up to 2019, I will not go out and campaign again and ask any woman to vote like I did before. I will never do it again. These are strong words from the first lady and I commend her for having the courage to speak out in this manner. She's probably frustrated with Daura and Kyari who have refused to allow her wield any influence in the Buhari government. I hope the president act quickly and resolve some of these issues. His party is already in crisis, he cannot afford another crisis among members of his immediate family. I dislike Buhari but this woman is very stupid to say the least. This is a matter capable of breaking her home. Many of us who voted for him share her view. Some dogmatic zombies think one has to be a proverbial fly that follows a dead body to the grave. The fact that we voted for PMB in 2015 and are yet to see a change says a lot. But what we must also agree on is that there is no better politician today. I may have no choice but PMB regardless, cos the rest of today's politicians are a waste of space...so corrupt and so dishonest. Until we the youths come together to identify those amongst some us that can do it, and mentor such persons for leadership. One might think that she is wailing. But, far from it, that is a voice of reason, a prove that she isn't a sycophant. She could have played to their dictates and concentrate on stealing us dry, but no, she's more concerned about legacy, about posterity and what could have been. That is a wife. Those evil hands just wanna cut, they don't care whose fingers are caught. Only a dutiful wife will be as concerned. When your husband is changing right before your eyes, becoming someone that you do not recognize, you know that the invisible hands are at work, and you should do anything to save him! I especially like her motherly instincts. She must have listened to the voices murmuring. It's now Clear who the hands behind the Tinubu brouhaha are. Mr. President should really watch his back, and especially the company. The wife must have had it up to here to spill it all out like she did on air. And, she must have discussed it with him in the bedroom but got no positive responses. I read a comment on Sahara Reporters where someone insinuated that those power mongers are never embarrassed. Instead, they will try to set PMB against the wife. In his words, "in the Villa there are no morals, no true friends, only back-stabbers, Power mongers and eye-servicers!" "Abi you think say na 'bridge of flyover' dis [kind] people come look for Abuja so?!" Nothing could be more true. Those words resonate with me. Imagine, even Mamman Daura's son was reaching out to BBC in an attempt to stop the broadcast. E be like na ehn entire family go lay mat for Aso. The scary thing is that they are the closest to the president right now. His true friends remain sidelined. So,e zombies think we have to follow the dead body to the grave. The fact that we voted for PMB doesn't mean we do not know why we gave him the mandate. Buhari will surely bring his wife to order. But your plans of pitching PMB against his loyal loving uncle is DOA. No one cares abt that, what matters is that she has spoken. If you like, cage her henceforth, your headache. It is a shame that you will rather support the misuse of public money while your mother in the village is starving. Aisha Buhari who could have stayed in her comfort zone has chosen to speak on your behalf, exposing those hidden power play which you can never know. And you come here to scream she is being manipulated. But of course, I understand your predicament, We cannot all be intelligent. Stop wailing. Aisha is on covert mode here. Mission: bait to get the real enemies show face fully. Next move is to crush resentment totally. Kyari and Daura are the king'gs men. They leave only when buhari leaves. No one caged anyone. You guys think you can get buhari move an eye lid using reverse psychology? Try harder, we know your plans and it wont work. My Sai Baba is smarter than y'all. Daura and kyari are more important to this "change government" than your corrupt master. You love 'SAi Buhari' more than his wife. What an irony. where were they during election? What were their contributions to the manifesto? Now you see why most of the items in the manifesto have been ignored? Cos these men you mentioned have waved them of. I hope the men you mentioned have a plan for his reelection too.. Oh yes, rigging. So Aisha too dey cast aspersions on this administration.. APC and show of shame are like siamese twins..
Whatever it takes, i trust them to deliver come 2019. Call it whatever u like. Just stop wailing and shut up. You really love Sai Buhari more than his wife. There is nothing I will not see in Nigeria. Sai Baba for life. Only ignorant wailers say nasty things about him. We all love him and can only get to love him more. Lalasticlala, now na morning o! Well said. The hallmark of a great woman. With Aisha nw, i think we've got the Nigerian women covered. If there's anyone to really give out these strong words, it can only be the first lady. I shake my head for you because your own zombiism don pass the tipping point. No more hope for you bro. Fayose's abuses don reset Aisha's brain. Hehehe. Well, Madam if you want Wailers registration form, you can come and have it. Even Kids sleep calmly in his arms knowing he's a man with a good heart. Propaganda of the Highest order. . . Everyone of us know the only First Lady that can talk as loosely as this. . . Her husband 'manhood' will always lives on anyways! This is explosive! Even Buhari's homefront is in turmoil for his wife to come out and say this. This man has mismanaged the goodwill he once enjoyed. All within less than two years. All you remaining Yoruba Sai Baba freaks still licking bubu's a$$, hope your eyes are clearing? ?